The government's bid to lift some of its stifling restrictions is a sign of progress. Small and medium-sized firms are, we hear from the government on repeat, the life blood of the economy. They’re part and parcel of a capitalist country, so it’s a significant step to see Cuba’s government announcing a move to legalise thousands of small and medium businesses that have been cropping up in the country. In a document published yesterday, the Communist Party detailed a plan for Cuba’s economic development, including the announcement that individuals could now create ‘private businesses of medium, small and micro size’ that would now be recognised as ‘legal entities’. The guidelines won’t become law until Cuba’s National Assembly approves them in July, but the fact it’s part of the plan at all is an interesting sign of the times. The country has gradually relaxed restrictions on self-employment during recent years as it seeks to stave off economic stagnation. As a result, everything from restaurants to hairdressers have been sprouting up (as long as they fit into one of the government's allowed categories). Up to a third of Cuba’s five million workers are said to work in the private sector, including 500,000 business owners. There’s yet to be clarification on additional rights such as the ability to import wholesale supplies or export products, but Cuban business owners will have their fingers crossed this could be allowed for the first time – removing a hefty obstacle to private business growth. To date, entrepreneurs have found themselves hindered – claiming ongoing harassment from tax inspectors and shortages of essential supplies. The opportunity to open bank accounts, do business with state-owned enterprises and trade internationally should open many doors though. 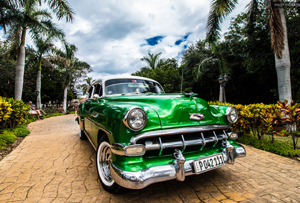 It’s also a positive sign for Cuba’s relations with the US – Washington and Havana are discussing strengthening trade after the US relaxed its travel and trade restrictions. All of which bodes well for the Cuban economy. It’s a slow-moving process, but it is a sign of progress.